April 15 — I am sorry for the mistake in the original version of this story that mischaracterized your position on the use of M-44 cyanide devices. I took action as soon as I was aware of this mistake to correct it. Although I was unaware when I wrote the story, I understand now that as sheep ranchers you value the use of guardian dogs as a method of predator deterrence and control and have historically opposed the use of M-44s at your operation and in other places. Thus I realize this mistake has the potential to harm your reputation. My mistake was unintentional, this apology is sincere and heartfelt, and this incident will remind me to remain eternally vigilant regarding others’ positions and views. 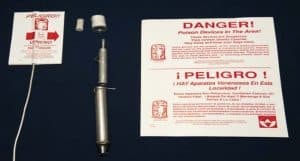 April 13 editor’s note — Jim and Cat Urbigkit did not specifically say use of M-44 cyanide bombs help keep their operation running, as originally reported by WyoFile. The Urbigkits, who operate the Paradise Sheep Company near Pinedale, wrote Wildlife Services saying they “would like to go on record in support of Alternative 1” in the federal environmental assessment Predator Damage and Conflict Management in Wyoming. Alternative 1 calls for continuing “the current WS-Wyoming Predator Damage Management (PDM) program using the full range of legally available methods,” including “M-44s for control of coyotes and red foxes.” Also, the story mischaracterized an alternative in the EA as calling for “immediate” cyanide use. WyoFile has corrected the errors and appended the EA comments by the Urbigkits and Sublette County Predator Management District to the story . Federal administrators who direct killing of predators to protect livestock decided Monday to temporarily ban cyanide bombs in Idaho but plan to continue using the M-44 devices in Wyoming. The U.S. Department of Agriculture announced the Idaho ban to the activist group Western Watersheds Project in a letter the group made public Monday. The letter responded to a petition Western Watersheds submitted March 28. The widely criticized devices were recently targeted by a lawsuit, the petition, and legislation after the poison traps killed three family pets and a wolf. The Department of Agriculture’s Wildlife Services arm plans to continue predator control with the controversial devices in Wyoming, action supported by an environmental review. The plan has drawn 116 comments, most opposing traditional wildlife-killing schemes and the use of cyanide bombs. The plan is nearing approval as Wyoming residents become more aware of the dangers posed by the devices following the death of two dogs near Casper last month. Just after that incident, another pet in Idaho died from an M-44 cyanide bomb, the release of which also sent a boy to the hospital. The 268-page environmental assessment titled Predator Damage and Conflict Management in Wyoming outlines continued use of the poison trap as a preferred alternative. “The methods which may be used by WS-Wyoming would include a variety of frightening devices, ground shooting, aerial shooting, denning, various trap devices, snares, trained decoy and tracking dogs, M-44s for control of coyotes and red foxes, and DRC-1339 for control of ravens and black-billed magpies,” the document says. Federal Wildlife Services trappers in Wyoming killed 236 coyotes and 65 red foxes with M-44 cyanide bombs last year, according to statistics posted on a federal website. The program is strongly supported by stockmen and the agriculture industry to protect livestock. Wildlife Services killed 24,157 animals in Wyoming last year, including 111 wolves. The agency classified 8,973 of those animals as invasive species, such as European starlings. Sheep ranchers Jim and Cat Urbigkit, of the Pinedale-based Paradise Sheep Company, are exemplary of such support. They said in comments the program helps keep their operation running. Another program supporter, Sublette County Predator Management District, said alternatives to today’s programs and M-44 use would be ineffective. The district rejected an alternative to cyanide use — a program requiring nonlethal efforts to dissuade predators before resorting to killing. But most of the comments on Wildlife Services’ plan to continue using poisons supported wildlife over historic killing programs, including use of M-44s. The overwhelming anti-killing sentiment comes despite federal guidelines and rules that seek to minimize unintentional killings. Those guidelines and rules include restrictions to M-44 use in areas where endangered species are present and that hunting dogs and pets are known to frequent. 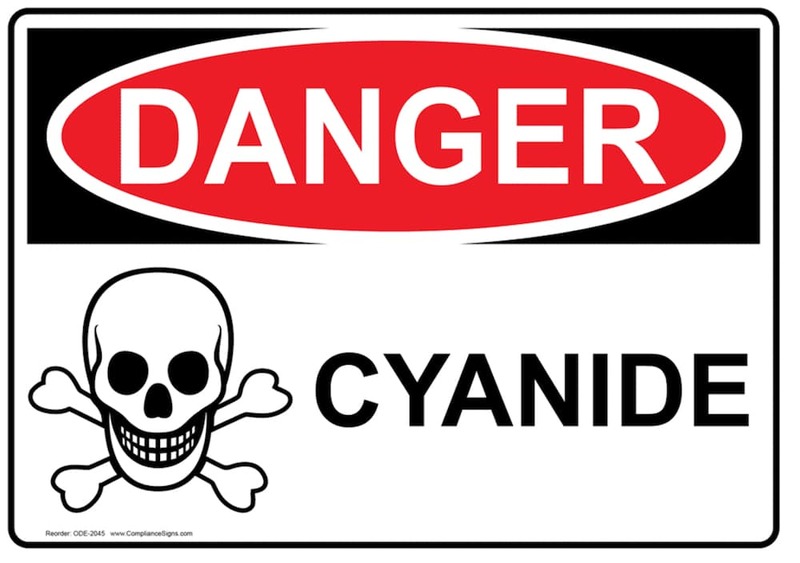 Last year there were three unintentional killings by M-44 cyanide bombs in Wyoming, all of them red foxes, federal statistics show. Comment on the plan closed Dec. 16 but a decision has not been finalized. An agency spokesman in Washington, D.C. said he would not speculate on when it might be adopted. 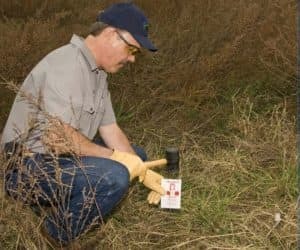 While the Department of Agriculture mulls renewal of the program, other forces nationwide have focused on restricting use of or eliminating M-44 cyanide bombs from the agency’s arsenal. Last week four groups sued to restrict, then review, the use of M-44s and another poison, compound 1080. The cyanide bombs are planted on the ground and release poison when a dog-like predator pulls on bait. Compound 1080 is put in special livestock collars and designed for release when bitten by a predator. The Center for Biological Diversity, WildEarth Guardians, The Humane Society of the United States and The Fund for Animals filed the lawsuit. It asks that a review of the poisons’ effects on protected species be completed and that the use of them be restricted until then. The groups cited the Idaho incident and the killing of a wolf in Oregon as two reasons for the action. The groups said 321 non-targets were killed by M-44s last year nationwide. 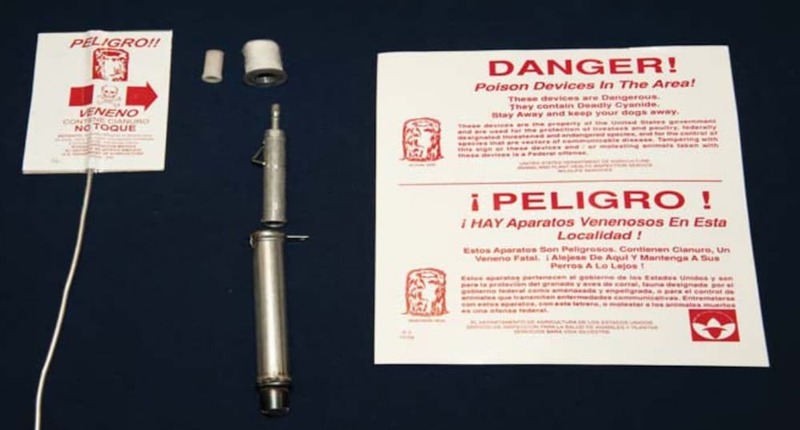 In Congress, U.S. Rep. Peter DeFazio, an Oregon Democrat, introduced a bill March 30 to prohibit sodium cyanide and sodium fluoroacetate, the ingredients in M-44s and Compound 1080 collars, from being used for predator control. The Chemical Poison Reduction Act of 2017 is necessary to reduce the risk to public safety, national security, the environment, and “persons and other animals” that might contact the poisons, the bill says. It would allow a fine and a sentence of up to two years for anyone who violated the proposed law. The successful Western Watersheds petition argued that the chemicals’ continued use is dangerous and inappropriate. Nineteen public-land, conservation, environmental, and wildlife advocacy organizations signed on to the effort. All told, Wildlife Services killed 7,933 coyotes in Wyoming in 2016, most of them by shooting from an airplane. In addition to M-44 cyanide bombs, Wildlife Services also uses a poison known as DRC-1339 to kill birds in Wyoming. The poison intentionally killed 7,795 starlings plus an additional 5,178 native birds, including crows, ravens and magpies. Wildlife Services used gas cartridges to remove or destroy 171 coyote burrows or dens and 55 red fox burrows or dens. Wildlife Services released a statement addressing the dog death in Idaho. “As a program made up of individual employees many of whom are pet owners, Wildlife Services understands the close bonds between people and their pets and sincerely regrets such losses,” R. Andre Bell wrote. “We are grateful that the individual who [was] with his dog when it activated the M-44 device was unharmed, however, we take this possible exposure to sodium cyanide seriously and are conducting a thorough review of this incident. “Wildlife Services policies and procedures are designed to minimize unintentional actions with domestic pets. It posts signs and issues other warnings to alert pet owners when wildlife traps or other devices are being used in an area for wildlife damage management,” Bell wrote. Victims of the two M-44 incidents, however, said no signs were present where the devices went off. Please see the editor’s note added April 13. False news. FACT: Sublette County has banned M-44s for years and the ranchers This ” journalist” quoted is on record saying they never contacted for the article. 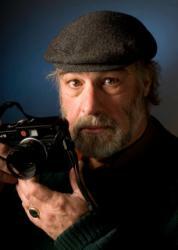 In fact, one is the author of several books on the use of guardian dogs for predation control. Please see editor’s note added April 13. This article and reporter is grossly inaccurate in many of its facts and it quotes concerning the Paradise Sheep Company. The Urbigkeit’s are the last ones to encourage use of the devices and first to oppose them several years ago in advance of the concerns over bringing back the wolf population. This kind of sloppy if not libelous reporting negates any attempts of positive environmental reporting to make for a better Wyoming f not world. Please see editor’s note of April 13. This article is misleading, you have taken a direct quote Jim and Cat Urbikit submitted to USDA out of context. You have framed their quote as if they are in support of the use of M-44’s, when in fact they do not support the use of M-44. Not once in their letter do they recommend the continued use of cyanide. Alternative 1 of the November 2016 USDA Environmental Analysis lists several control options including frightening devices,ground shooting, aerial shooting, denning, various trap devices, snares, trained decoy and tracking dogs, M-44s for control of coyotes and red foxes, and DRC-1339 for control of ravens. Think about this for a moment, why would anyone who actively utilizes Guardian Dogs in their livestock operations support the use of cyanide ? That makes absolutely no sense. I am so tired of reading that the Mansfield boy was “UNHARMED”… He is still suffering from serious headaches and overall not feeling well, yet the Department of Ag continues to state that he was UNHARMED! This is FALSE!!! Please watch the news reports and his mother and father stating these facts. They are also my friends and I also know these facts… These BOOMS and chemicals need to be banned NOW! Not after someone gets killed. Amy Helfricks family was lucky her daughter was not with them as usual and was not exposed that day it killed her dog and her sister-in-laws dog… Please stop this now! I have written to ADC/Wildlife services about these devices and also congressionals. I am not sure what else to do. Not only do I worry about my dog, but cyanide bombs are indiscriminate, killing anything that touches them, not necessarily the coyote causing trouble in a sheep band. Other ways of protecting livestock exist–guard dogs, capsaicin treatment of the sheep’s fleece, and others. The cost per animal unit month on federal land is way cheaper than on state or private, in part to recognize the potential cost to permittees due to predation, noxious plants, and other hazards. I too hate to have my tax dollar going to the random killing of wildlife when there is conservation work to be done. Wyoming Untrapped is advocating for the immediate discontinued use of M-44s in Wyoming. They are indiscriminate devices that are killing pets and wildlife, and endangering people. These lethal devices have no place in our state where children, pets and the public may come into contact with them and other alternatives are available. We will be working with many other partners to continue to educate the public about these unnecessary lethal devices and demand that the U.S. and the Wyoming Department of Agriculture stop their use. Waiting until more pets, a child or adult is killed by these deadly devices is too late for action. Besides being a rogue agency that is mostly unaccountable and purposely hides its activities from public eyes whenever and whereever possible, it was improperly named from the get-Go. p.s. Every county in Wyoming partners with Wildlife Disservices by way of its county predator Control Board, and helps fund the combined operations under a State program. So the State of Wyoming is either complicit in this or has some clout when it comes to operations. That State-Federal complicity is rarely touched on , but should be. For instance…every county pr4edator manager is required to present a report to their County Commissioners each year on their activities, expenditures, and budget. That much is public record. In the case of my Park COunty , Wildlife Disservices and Park County Predator Management are joined at the hip, and among other things they spend a lot of time and money dealing with wolves. Here’s the thing(s). Both Wildlife Services and the County are facing severe funding cuts in coming fiscal years , just as wolves and grizzlies are coming under state ” management”. Not only that , but the Wildlife Disservice airplane crashed and killed its two occupants last fall near Otto in Big Horn County and they have not been flying for coyotes of late, so they’ve had to revert to a ground war on the canids. Funding will become a serious issue for Wildlife Disservices and your state and county predator killers in coming years. That could be good, or make things worse. it’s hard to know since they assassins are secretive. So interesting that not one of these supposed Christians who live in Idaho and Wyoming have she’d a tear for the coyotes or foxes, who also died horribly, God’s creatures though they are too. I don’t classify myself as an animal rights person or a vegetarian but this cyanide killer device is just way too cruel. Coyotes and foxes will be killed one way or another, there is nothing we can do about that. I have shed a tear for all of the animals that are killed, it keeps me up at night. Ranchers can do whatever they want, because they are “feeding” the country! Trappers are doing the bare minimum as far as making the public aware of such devices! That’s not good enough. My dog and my sisters dog were the ones killed outside of Casper! Ranchers should pay for their own “poison”, or simply find another way for predator control. I do not want my tax dollars going to pay for these! What is it going to take to ban these horrific devices? A human being killed? It will happen. Fortunately it wasn’t my 8 year old daughter who was with us when our dogs were killed! Why isn’t the tracking and killing of predators by Federal Wildlife Services not considered by farmers and ranchers to be governmental overreach?